BuzzinBumble: Book Release News! Mr. Sunshine, Wandering Camera & One Monthly Goal too! Book Release News! Mr. Sunshine, Wandering Camera & One Monthly Goal too! April Fool's Day turned out to be fun in more ways than one. I got my husband Jim with a Really Sneaky Prank. This doesn't even begin to catch up for all the times he has scared the wits out of me. Which, by the way, is not very hard to do when someone is as hard of hearing as I am. I can't hear him coming and have been trying to train him to walk like an elephant, to no avail LOL. The kids were texting back and forth all day wondering if he fallen for the prank yet. It didn't happen until 1:30 in the morning and then his tiredness made it all the more effective. 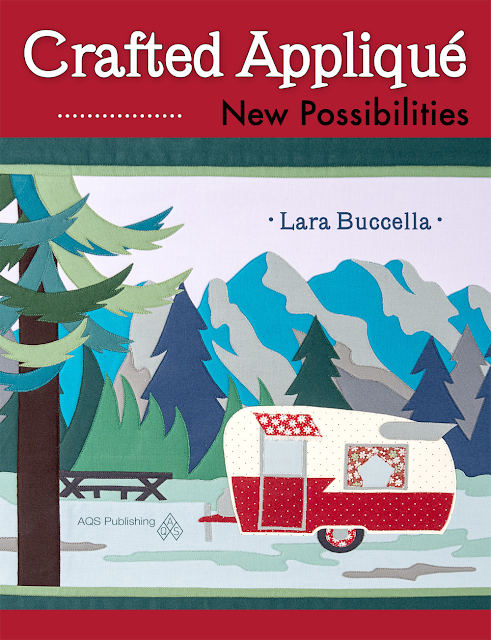 Then Judy, who blogs at Quilt Paradigm let me know that April 1st was also the day my book, Crafted Appliqué was made available for purchase on the American Quilter's Society website. Besides how funny that struck me, it is also cause for celebration! I can hardly believe that I'll get to see it in print soon! I began this book writing journey almost three years ago and it hardly seems like it could be real. I hope you all will stay tuned for the Crafted Appliqué Blog Tour, which begins in May! There will be lots of great posts and book giveaways from many of your favorite bloggers! If any of you would like to purchase a signed copy directly from The Author (that would be moi) I have set up a Big Cartel shop just for that purpose. Crafted Appliqué is on sale now and available for pre-order. You can purchase it by clicking on the book photo on the top left sidebar or this one below. Thank you to all of you for the support and interest you have shown so steadily over the last ... oh... almost two years! I'd like to share a really fun mini quilt project with you, which Amy DeCesare (Amy Made That) designed to support her very good friend Dan who has leukemia. Dan is fighting back with a fundraising drive for blood cancer research, run by the Leukemia and Lymphoma Society's Man and Woman of the Year Campaign. Amy designed "Mr. Sunshine" in Dan's honor and is donating all the proceeds from the sale of the pattern to his campaign. It's only $3 on Craftsy - a great bargain for a really good cause! I love Amy's "Mr. Sunshine" pattern. She is an excellent teacher and her patterns are always a joy to work with. I learned a new way to sew Dresden blades with this one. It's fun to try out new techniques on something small and it's also great when you need the instant gratification of a quick project. For my "Mr. Sunshine", Alison Glass Sun Print fabrics seemed very appropriate. I love the way Amy edged her mini quilt with ric-rac, but chose plain black binding for these modern fabrics. I'm hoping to take these beautiful, hand dyed batiks and make an ocean themed improv mini quilt. I'll probably only get as far as sewing the quilt top, but am aiming toward making a gift for the midwife who delivered our granddaughter Eden. Cathi went way above and beyond the call of duty, treating Kait like her own daughter. She loves everything having to do with the ocean, so I think a mini quilt like that would be a great surprise for her. Fabric pull for an ocean themed improv quilt. Thursday is Soma's monthly linky party for Wandering Camera at Whims and Fancies. It's a great chance to learn more about photography from Soma and practice getting great shots with your camera. It's also a really fun linky party to hop around because you learn a lot from everyone there, while getting to enjoy beautiful pictures at the same time. There are always so many wonderful things to share, that my posts can get a bit long. Thanks for sticking with it through to the end! SO excited for you to receive your box of books -- ENJOY the moments!! Where to start?!! Congratulations on your book journey! I'm sure you are anxious to have an actual physical copy in your hands :) Love your April Fool's prank. I love your selection of blues. They will make a gorgeous mini. And thanks for sharing a link to Mr. Sunshine. I will have to pop over there. Last but not least, please give the adorable Pip a pat/tummy rub/whatever form of affection she prefers from me. What a wonderfully horrible prank, I didn't know you could be so evil, LOL. Makes me like you even more. Such a great portrait of Pip, yep they rescue us. It sounds like you had a fabulous Friday (whether it was April Fool's Day or not)! Congratulations on your book being available for purchase, that must be very exciting to see come to fruition after so much work. The mini quilt is lovely, and I hope the pattern helps raise money but also bring some love and good vibes for Dan. I was scared just looking at the photo. I think I would have passed out if it had been done to me. Kudos! Congrats again on the book. Enjoy!! Good luck with your April OMG -- those are beautiful blues. I am getting so anxious to get your book Lara!! Those are beautiful "ocean" fabrics and the little mini quilt is so cute!! I am off to buy the pattern right now! Ha ha, I forgot to ask you how the prank worked out! Mr Sunshine is a cute pattern for a cause that needs the sunshine! Your fabric pull looks right on target for an ocean mini. Can't wait to see the finish. Pip looks extra cute. I have figured out my zoom lens for far away pretty good. I need to try that for up close shots. Oh....you are bad to the bone!!!! That would freeze a guy up! I am so looking forward to seeing your new book. That is so exciting and such a labor of love. Your blues are yummy and will make such a nice gift for the midwife. Soma's camera series has been wonderful. I have always been terrified to change any settings on my camera, but have had fun playing around since reading them. I am so excited for you. I can't wait to see your book! Congrats!! Coongratulations on your book! Can't wait for the blog tour. Your Mr. Sunshine is fabulous. Hurrah!!! Going to click on the book and reserve mine now! Love your prank. April Fool's day is my favorite. I love to prank the kids and husband! Thanks for visiting my blog. I enjoy reading about your family. Congrats on your new book. Congrats on the book! Love the April Fool prank that was a good one. The pull for the ocean improv is wonderfully delicious. Adorable photo of Pip! First off that Aprils fools prank... Mean, just mean, I would now be living in a hotel! second - YAY!! Congrats on the Book!!!!!! What a fun post to read!! Congratulations on your book launch at AQS site!! I can hardly wait to get my hands on your book! No wonder your family could hardly wait for Jim to meet his new "friend" ! Did he scream out loud?? 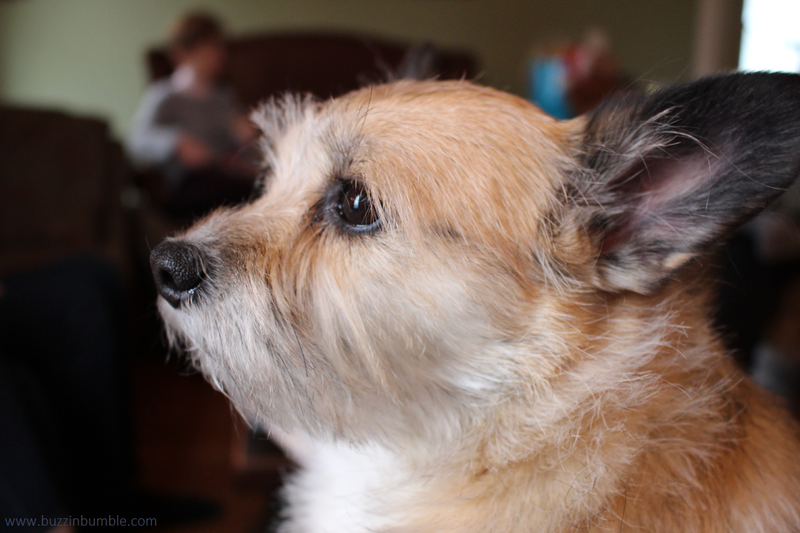 Little Pip's portrait is beautiful... you are using your new camara to the max already! Aren't our furry babies such a blessing to us!! Congratulations Lara! On the killer prank - and on the book news! Love your sunshine mini quilt. He looks especially sunny against that black and white background. Congratuations on your book! How exciting! 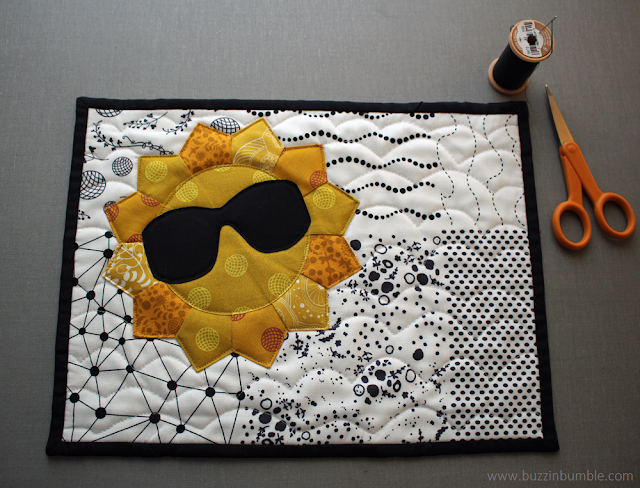 I love your Mr. Sunshine mini quilt. Perfect for lighting up the day! So excited about the book, congratulations! You are wicked woman! Love the photo of Pip, such emotion and feeling to that pic. The ocean fabrics and color are wonderful. What is better than sunshine, very nice pattern, hope they do well with it for their cause. Pip is indeed looking noble in this picture. But he also did in the picture where he was wearing glasses. Was it in your post about you Delectable Mountains Quilt? I wondered how the prank worked out, but I'm glad I wasn't the victim of such a frightful prank, brr! You must be permanently on the lookout for the box of books, so exciting! Thanks also for the link, that looks a lovely pattern, Amy makes such lovely items! Your pup looks so cute, you have a lovely companion there, I'm sure. I can hardly wait to see your book! Congratulations Lara! I may have woken the entire neighborhood had I discovered that in the middle of the night! So ex item to hear a out your book, going to have to get it when I return home. Love the cute little Mr.shine,going to have get that too...I am sure it will brighten up my work space. Pip is such a cutie. My husband is happy with one dog, I want another, so I am sure can can wear him down one day....lol! So excited....to hear. Darn spell check. Congratulations on the success of your prank AND your book going on sale! I LOVE the fabrics for your goal! Congratulations Lara! It is so exciting to watch this project reach fruition. After all this time I still love that little caravan too. 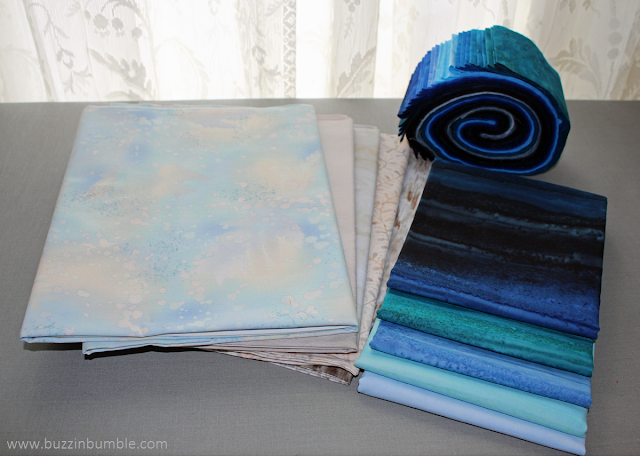 Your fabric pull for the mini quilt is gorgeous - just right to evoke the ocean; can't wait to see what you come up with. Congrats on your book release, Lara! What an accomplishment. It is amazing to me all the work that goes into publishing a book, so I can see why you are absolutely thrilled. Your prank was hilarious. That was a scary looking picture--it did look real. It must have been excruciating for you to wait that long for Jim to discover it. Your mini quilt is adorable--much needed sunshine, and for a great cause. I'm looking forward to seeing your ocean quilt--the fabrics are perfect. Your puppy picture is great, too. I'll will need to set aside some time tomorrow to browse Wandering Camera. Congratulations on your book Lara! Your blog is really lovely with all your creations and your lovely baby ! How is it possible for one person to accomplish so much??? You shame me, Lara. Congratulations on the book. I am very happy for you!!! That pattern is so bright and uplifting in more ways than one. Those blues are gorgeous but I am sure they will become something even more wonderful in your hands. I saw that spider on my IG feed and it scared me! Congrats on your book!! Oh you are sneaky one! Poor Jim!! I can just hear you squealing in laughter. Your book is already on my Amazon wish list, I am all poised to pounce on it. Congratulations! I am so happy for you, Lara. Mr. Sunshine is such a happy mug rug for a wonderful cause. I love the prints you used for it. I can’t wait to see the mini you will make for Cathi. You could not have picked better colours to represent ocean. Congratulations on your upcoming book. I'm sure it will be a big hit. I've always admired the RV on the front. And what a doll Pip is! Congrats on your book release! I can't wait to be part of the blog hop next month, thanks so much for including me! Congratulations on your book!!! I am so excited for you. Have fun quilting this month. Congratulations on the book! How wonderful to see your own work in published form. I love the Mr Sunshine mug rug. The fabrics you used are really dazzling! Can't wait to see what you create with those gorgeous batiks. You are such a thoughtful person. Your sweet Pip looks like he's ready for action. Do his ears always sit up like that? What a cutie, he must love you every day for rescuing him. Have a wonderful day! I'm so happy for you, Lara. And excited. And proud. Well done!!! Congrats on your book, Lara! That's fantastic!